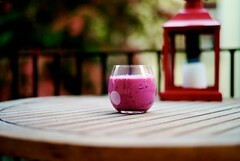 This is our tried and true Fruity Nutritious Smootie recipe we’ve used for years. It’s perfect for quickly satisfying hunger. Add all ingredients to blender and mix until well blended. This will make one large serving or two small servings. Pour leftovers into popsicle molds to create tasty frozen treats for later. Enjoy! This entry was posted in Recipes and tagged Almond Milk, Banana, Coconut, Coconut milk, Coconut oil, Flax Milk, Flax seeds, Fruit, Garden of Life, Paleo, Smoothie, Stevia. Bookmark the permalink. Pingback: SMOOTHIES TO THE RESCUE!!! « Everything Vegetarian Fabulous.